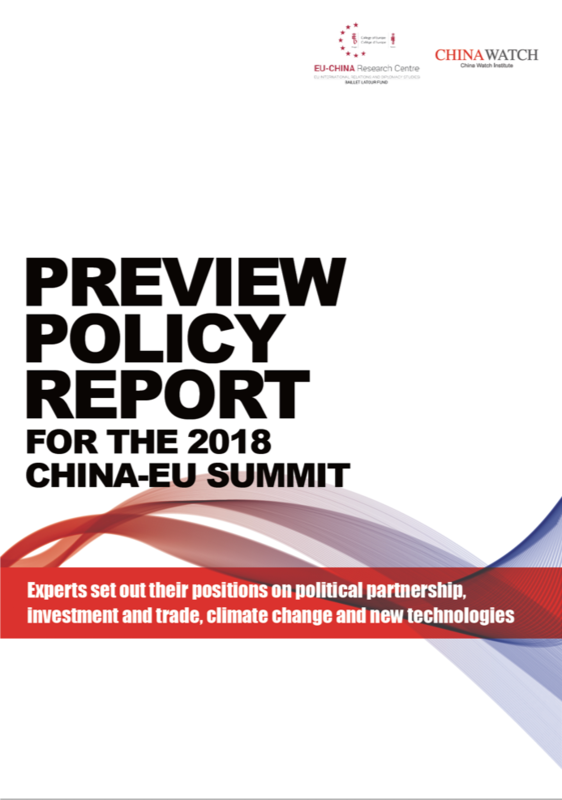 Here is my article about a new disruption approach to climate change that was published as part of China Watch first "Policy Review Report" for the China-EU Summit. Download the full Preview Policy Report here. Or see a web-version of my article here. All major studies clearly indicate that current climate measures are far from enough. Still, most of the discussions about climate action revolve around more of the same. This makes little sense, as we need radical reductions, have just entered the fourth industrial revolution, and will see major changes in all parts of society. We have a unique opportunity to leapfrog current obstacles and focus on paths toward an ecological civilization by supporting the disruptive and exciting changes needed, rather than incremental improvements in existing systems. 1. We need to reduce emissions in order to avoid a 1.5°C, or at least a 2°C, warming. 2. We want to achieve a zero-carbon economy sometime between 2050 and 2100. 3. We can achieve what we want by engaging the big polluters and help them reduce their emissions. Let’s start with why we need to reduce emissions. Over the years the 2°C goal, and lately the updated 1.5 °C goal, has become the way to express the dangerous climate change that we must avoid. There is no doubt that a 1.5°C , let alone a 2°C, warming is likely to result in extremely severe suffering and irreversible damage to the world's ecosystems. Still, for the vast majority of both citizens and decision makers the 2°C goal has not been enough to move them outside their comfort zone. If we instead answered the question why we need to reduce emissions by saying: To avoid the end of human civilization, and even the end of the human species, we are likely to get a fundamentally different response. We can expect an initial period of doubt where many would initially dismiss climate change as an existential threat as hyperbole. This is understandable, as we live in a time of exaggerations. In this case, however, it would become clear that theIntergovernmental Panel on Climate Change(IPCC)and leading scientists for a long time have provided probabilities for extreme warming that potentially could end human civilization. The latest assessment report by IPCC indicated, for example, that the exceedance probability for 5°C is more than 1 in 100 for the current amount of emissions in the atmosphere. If we reach 600 PPM, something that is highly likely looking at current trends, the probability of more than 5°C warming is above one in four and the probability for more than 10°C warming is 1 in 100. This kind of extreme and rapid warming would threaten human civilization as no meaningful adaptation measures exist. If we compare the acceptance for other events such as fatal flight crashes (approximately one in a million probability), the probability for 10°C warming that could mean the end of human civilization, is magnitudes higher. It is worth noting that the uncertainty regarding these numbers are significant, a fact that makes rapid action even more urgent. With climate change understood as an existential threat we could move from a discussion about how much we can still emit, so called carbon budgets, to how fast we must reduce emissions in order to keep the probability of catastrophic events as low as possible. New groups, with a focus on large-scale disruptive solutions and unafraid of ambitious projects, could emerge as the next generation of climate action leaders. Some people will argue that talking about an existential threat is too scary, and that people need inspiration, not fear. Let’s start with the argument that the information is too scary. What should matter is if the information is true or not, not if it seen as scary by some people. Many of those who are objecting to discuss climate change as an existential threat are those afraid of rapid change, both in business and in the environmental community. What these groups see as only scary, a new generation of policymakers, business leaders, entrepreneurs and climate activists, also view as scary, but also inspirational. The urgency is a call to action, to explore new ideas and try new things, and to do this in collaboration on a global scale. Many individuals and groups have begun to base their whole way of working around the need to deliver what is actually required. This brings us to the second question, what we want to achieve, a question that also addresses the need for inspiration. The current goal – a zero-carbon world – is important but is only an absence of a bad, not a positive, vision of the future. With rapid technological development, emerging new business models, values in support of global collaboration and greater understanding about the complexity of nature, we have the opportunity to establish a much more exciting and ambitious vision. A seed for such an inspirational vision could be the idea of a global eco-civilization by 2100 with a focus on science, natural beauty and art, where everyone has a flourishing guaranteed income and society is based on what half of the earth can provide (to leave room for other species to thrive). Solving the urgent climate challenge would then be an important step toward the next era for humankind. Instead of different groups addressing different problems in isolation, we would likely see different groups come together to help accelerate the change toward an eco-civilization from different directions. Now for the third question, how we will achieve this? If we view climate change as an existential threat and have an attractive vision for the future, it becomes obvious that the kind of tinkering with carbon prices, transparency in relation to emissions and attempt to get big emitters to reduce emissions, might actually be part of an incremental problem-based approach. Instead we need to embrace disruptive change and promote the tools and initiatives that support such change. A global network of solution accelerators for zero-carbon solutions in support of an eco-civilization should be launched as soon as possible. If the Sino-EU annual summit makes progress in at least one of the areas above it would be an important contribution to a new chapter for global climate action. Dennis Pamlin, founder and CEO of 21st Century Frontiers and senior adviser at the Research Institutes of Sweden. The author contributed this article to China Watch exclusively. The views expressed do not necessarily reflect those of China Watch. Download the full Preview Policy Report here. Or see a web-version of my article here.